A dragon-themed light and sound show lit up the Burj Khalifa to mark the Chinese New Year in Dubai. The Downtown Dubai visitors experienced a captivating show that paid tribute to the thousands of Chinese residents in the UAE as well as guests from China. The show had a unique dragon-theme, keeping with the Chinese cultural symbols and traditions. Chinese expat, Hattie, who watched the show with her two-year-old daughter from the Souq Al Bahar bridge, said: "This was the best ever celebration of the Chinese New Year in Dubai. The attention given to the fine details of our culture were fantastic and bigger and better than ever. I have been in Dubai for many years but this kind of show and celebration was for the first time for me. I and my kids were thrilled to see this show that reminded us of our home country. Yumi Song, a Korean expat, who watched the show with her family, said it is not only the Chinese who celebrate the Chinese New Year but also Koreans who mark it in a big way. "We call it Lunar New Year and it is the biggest festival for us. It is just the traditions of Koreans and Chinese are different but our roots are the same; so we also celebrate it in a big way. Last year, my parents came here to Dubai to celebrate it and this time my in-laws are here with us to take part in the festivities. The show tonight was a pleasant surprise for all of us. Organised by Emaar Properties, the show started with a dragon taking flight from the Great Wall of China, soaring high in the sky, and touring over Dubai's landmarks including the upcoming Dubai Creek Tower before marking a splash at The Dubai Fountain. After its fun and frolic in the fountain, the dragon, in all majestic grace, swirls up and flies around Burj Khalifa. At the pinnacle of the tower, the dragon releases a shining pearl from its mouth on to the spire. 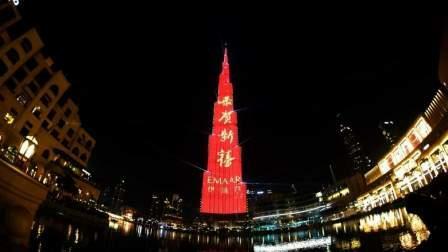 A 'Happy New Year' message in Chinese was then displayed on the Burj Khalifa's façade bringing the display to a remarkable close. The Chinese New Year celebration at Burj Khalifa by Emaar compliments the celebrations at The Dubai Mall, where many activities have been lined up that will take visitors on a journey through China's vast provinces with various region-specific artforms including music, traditional dance, arts, crafts and cultural demonstrations. The UAE has over 4,200 Chinese companies while over 253,000 Chinese nationals live in Dubai. Visitors can enjoy the show every day until February 24.